fan art. . Wallpaper and background images in the Nightmare Before Christmas club tagged: the nightmare before christmas. 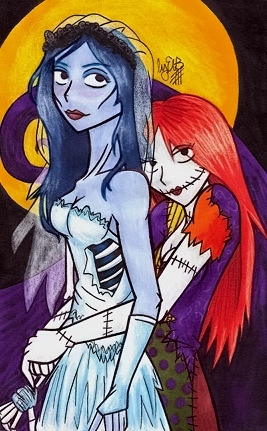 This Nightmare Before Christmas fan art contains anime, comic book, manga, and cartoon. Are they friends, or are they ( I know you are gonna hate me but) Gay? Just asking, DON'T HATE ME!!!! Absolutely gorgeous! I love it! And Cameronnn, why would people hate you? I think that was the point of the picture anyway.